It’s time for some more of that other white meat. I’ve got my sides ready, all I needed to do was check the freezer for some meat. I have just over a pound of thin pork chops and now dinner is ready. No really, in less than 5 minutes, dinner will be set for tonight. I don’t want to turn on the oven and I don’t even want to make any gravy, I just want something yummy with very little effort. Sound good to you, too? Good. Enjoy! 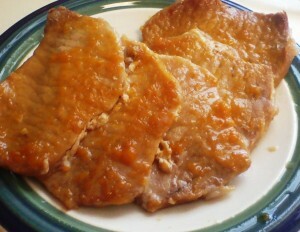 Lay pork chops flat in crock pot. Cover meat with jam. Pour white wine around the edges, not on jam. Cook on low for 4 hours.